Sending two, returning one is a special case of capture two, recapture one where one player sends two stones to be captured by putting them into self-atari before recapturing one stone, as the following diagrams illustrate. This corner is seki. However, . . .
. . . Black can play - . Such play seems ridiculous, but it costs nothing by area scoring. (Black loses a point by territory scoring.) If the rules allowed Black to do so, he could extend the game indefinitely, or both players could collude to do so. Different rules deal with sending two, returning one differently. Under area scoring a play inside territory to prevent this would cost nothing, right at the end of the game. That isn't the case under territory scoring; it may be practical to give back one point eventually. Actually it's area scoring that has a problem with "sending two, returning one". Black will endlessly attack instead of losing by 6 - 4 = 2 points. Robert Pauli: (years later) Let me reword it. Territory scoring does not need any cycle prevention rule to stop S2R1, area scoring does. Now clear? Therefore Charles’ statement above ("An aspect . . . it may be practical . . . ") and his example below make no sense. While te-ire indeed always costs a point under territory scoring, this goes together with not needing to stop S2R1 — you happily invite it, until you piled up enough. 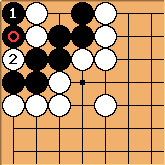 Harry Wang: Actually, in GO, endless attack by black is NOT allowed. The game ends with white winning over black. Warfreak2: Can't Black play in the lower left corner and make seki, therefore losing by the same amount without starting a recurring loop? Or does White have some advantage in breaking the seki? VisitingHalfwit? : Warfreak2, I thought I'd clarify this in case anyone else reading this shares your confusion. You are misunderstanding because Mr Pauli has made an English grammar error fairly commonly made by Germans. What he means to say is 'Black will endlessly attack INSTEAD OF LOSING by 6-4=2 points. In other words, rather than lose, black attacks endlessly and prevents the game from ending. However, this is only valid if you have a ruleset that uses area scoring (or territory scoring with pass stones) and has no form of superko rule. This doesn't apply to any of the three major rulesets. Under Japanese rules the tactic is legal but would still lose the game, because Japanese rules use territory scoring without pass stones, so with each repetition white would gain a prisoner, until eventually he has so many prisoners he can afford to just let black take the whole board, and still win. Under Chinese or AGA rules, this wouldn't work because Superko would forbid the endless attack. Robert Pauli: Don't get it. As soon Black ataris in the original diagram, White takes 5, one shape or the other, and can't be prevented from making life. Robert Jasiek: Re: Pauli: Area scoring has as little problem with sending-2-returning-1 as it has with any other scoring position. Under area scoring, the problem is not one of scoring but one of ending the game by means of rules restricting repetition. A superko ko rules is not required but some rule(s) that restrict repetition; there are also other kinds of such rules. Under territory scoring of Japanese / Korean style, sending-2-returning-1 is not only a problem of strategy during the regular alternation and of the implied meaning of no result rules but is also a problem of assessing life and death status. - Re: Wang: One may not say in general that endless attack were not allowed. Only the Ing 1986/91/96 Rules think in terms of attacks (calling it "to disturb"). Other restriction rules argue differently. In particular, Japanese / Korean style no result __allow_ infinite attacks and (Japanese 1989 Rules) in hyothetical analysis even presume it as one possibility for variation. Who wins depends on rules, komi, actual play. So one cannot say in general that the game would end with White winning. - Re: VisitingHalfwit? : White it not required to end the game but may continue it infinitely, at least according to the literal rules reading. It requires interpretation of intention that White is supposed to have a duty at some time to claim his win. Bill: Example, please. I do not believe I have ever seen a sending-2-returning-1 position that could be prevented by a play inside one's territory, except by preventing the seki in the first place, which would be a sizable play under either scoring style. Charles I was thinking of something like this. White is dead but . . .
White at a is a threat (to make seki) so that Black must capture two; White then can recapture one to repeat the board position. If Black eventually plays b that prevents the repetition. unkx80: Uh, White a is a threat to make seki? Isn't it a direct atari? Charles Matthews Ah yes - with another external liberty for Black it would threaten seki. Bill: Thanks, Charles. Interesting position. But the threat to prolong the game is slight. Now Black can play at with no net loss, regardless of scoring method. There may be no such play, as in the case just cited and also in the example on the superko page. Then in principle under territory scoring one allows the opponent to do it 100 times (say) and then passes instead of continuing round the cycle, allowing the opponent to take a few stones. Under a superko rule such positions cannot be repeated indefinitely. Had something like this in my game and found an interesting solution. We played under japanese rules. W sends 2 and returns 1, B passes. W again sends 2 with returning 1, B passes. W makes it again. If B would pass, game will be end as a draw (played on KGS - dont sure about other systems) - so B fills 1 point inside his territory otherwhere (loses 1 point according to japanese rules). W repeats process. So at each cycle B gains 2 points. Even if that ko worth 100 pts, B can give it up after 51 cycle^). So main problem - if B has enough inner territory to do this. PS. Under Chinese rules, B takes 3 point at each cycle - or i m wrong? RP: Wrong, since the area doesn't change. Robert Pauli: (years later) Is there a KGS rule that declares jigo after completing three cycles? That seems to have moved Black to fill territory. But since each cycle actually only gains him one point, that's in vain.